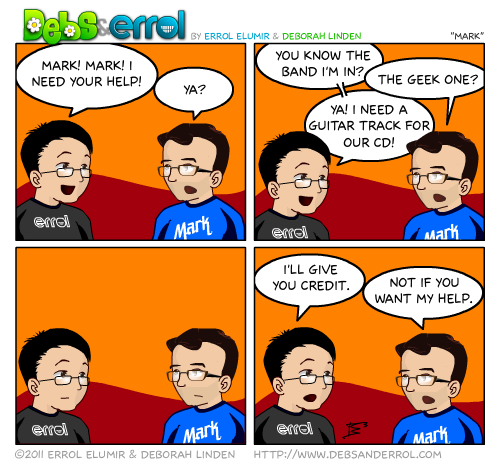 Errol: Mark and I have been playing together for almost 8 years. He’s played guitar on a number of my songs. One day, I will have him play at a Debs & Errol gig. I just have to trick him somehow. With his attitude, you’re gonna have to buy him a paper bag to put over his head. And that’s okay, guitarists don’t read music anyway! *laugh* Well, I hope to dress him up in a Stormtrooper costume. 😀 There’s a reason he’s ornery, he’s had to deal with me for the last 8 years! Seriously? Everybody gets a cartoon personality except me? SERIOUSLY??!! !